AT THE NORTH CAROLINA ARBORETUM…The Kaleidoscope outdoor exhibit will run through the end of October at the 434-acre Arboretum and features amazing outdoor sculptures by ten regional artists. Additionally, from the Arboretum website: The Baker Exhibit Center presents three exhibits that promote preservation of the Earth’s richness and biological diversity. Our Weakening Web, with interactive components to encourage hands-on learning, explores the process of extinction and the ecological relationships that bind all life forms together. Photography exhibit Thoreau’s Walden offers visitors a chance to return to the outdoors, and capture the natural beauty that inspired Henry David Thoreau. In the Exhibit Greenhouse, look for three living dioramas of well-known North Carolina habitats, and discover how much we have lost from each. More information is available at www.ncarboretum.org. 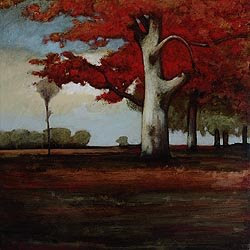 AT BLUE SPIRAL 1 GALLERY…Six artists articulate the season with rich and vibrant works in the Fall Color display. Fall Color features several different art forms, such as wood, fiber, clay, and painting (like William Brian Hibbard‘s work below). Also at Blue Spiral 1 are works by innovative sculptor Alex Gabriel Bernstein, abstract artist Michael Barringer, painter Daniel Nevins, Paige Hamilton Davis who forges steel into vessels and figurative works, and ceramics artist Stacy Snyder. Check out www.bluespiral1.com for more information. AT THE BLACK MOUNTAIN CENTER FOR THE ARTS…All month long, the Black Mountain Center for the Arts is featuring the work of photographer Joye Ardyn Durham in its exhibit titled, Beyond the Visible — Color Digital Infrared Photography. Joye has had more than 40 year’s photographic experience and has had her photography published in various publications throughout the US and Canada. Her images have been used by Paramount Pictures for such productions as the movie “28 Days,” and the television shows “Ed,” and “The Job.” Most recently, Joye’s work can be seen on display at Grandfather Mountain as the First-place winner in the Scenic Photography competition of the 2008 Grandfather Mountain Nature Photography Weekend. For information, visit www.blackmountainarts.org. AND AT THE INN ON MILL CREEK…For guests who will be coming to stay at the Inn on Mill Creek, keep in mind that we have the beautiful works of two artists on display. You can find out more about Marguerite Welty and Lisa Walraven in one of our July blog entries.